Saint Patrick's Day at the 'House! Saint Patrick's Day is on our radar. We'll be gearing up with the only Smoked Corned Beef and Cabbage in town. We house cure our corned beef from fresh whole beef briskets, then smoke them over hard wood hickory. 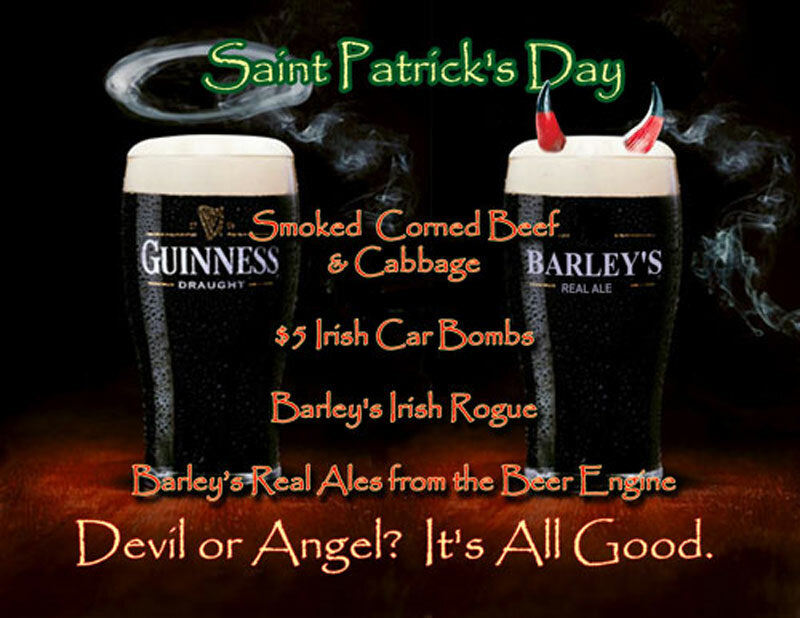 We'll also have our full line up of fresh craft brewed Smokehouse ales and we're offering $5 Irish Car Bombs all day. Sint Patty's Day falls on a Sunday this year, so we also feature 55 cent smoked wings and $10 on select Smokehouse ale pitchers. If that's not enough, we're introducint something new this year. You know us for our famous Mildred's Sauerkraut Balls. For Saint Patrick's Day, we're also making Smokehouse Reuben Balls, made with the same smoked corned beef as our entree. They'll be served with a side of Thousand Island dressing. We'll also make sure we've got plenty of Jameson on hand, as well as a full complement of single malt Scotch whiskys. See you on Saint Patrick's Day. Only at Barley's Smokehouse & Brewpub.